Many stationary sources discharge visible emissions into the atmosphere; these emissions are usually in the shape of a plume. This method involves the determination of plume opacity by qualified observers. The method includes procedures for the training and certification of observers, and procedures to be used in the field for determination of plume opacity. The appearance of a plume as viewed by an observer depends upon a number of variables, some of which may be controllable and some of which may not be controllable in the field. 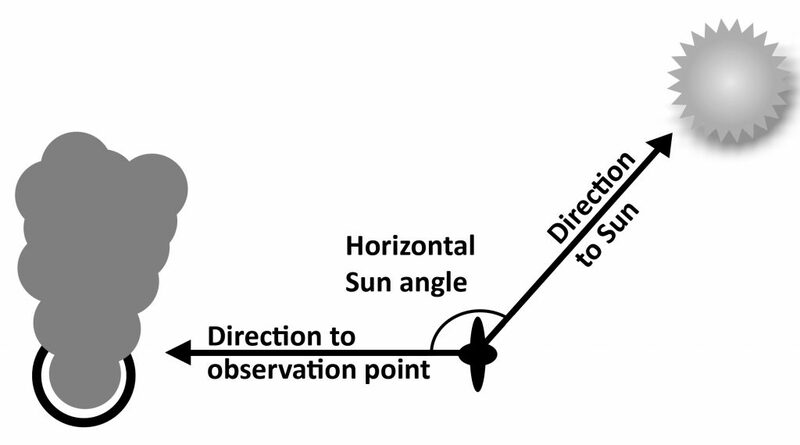 Variables which can be controlled to an extent to which they no longer exert a significant influence upon plume appearance include: Angle of the observer with respect to the plume; angle of the observer with respect to the sun; point of observation of attached and detached steam plume; and angle of the observer with respect to a plume emitted from a rectangular stack with a large length to width ratio. The method includes specific criteria applicable to these variables. Other variables which may not be controllable in the field are luminescence and color contrast between the plume and the background against which the plume is viewed. These variables exert an influence upon the appearance of a plume as viewed by an observer, and can affect the ability of the observer to accurately assign opacity values to the observed plume. Studies of the theory of plume opacity and field studies have demonstrated that a plume is most visible and presents the greatest apparent opacity when viewed against a contrasting background. It follows from this, and is confirmed by field trials, that the opacity of a plume, viewed under conditions where a contrasting background is present can be assigned with the greatest degree of accuracy. However, the potential for a positive error is also the greatest when a plume is viewed under such contrasting conditions. Under conditions presenting a less contrasting background, the apparent opacity of a plume is less and approaches zero as the color and luminescence contrast decrease toward zero. As a result, significant negative bias and negative errors can be made when a plume is viewed under less contrasting conditions. A negative bias decreases rather than increases the possibility that a plant operator will be cited for a violation of opacity standards due to observer error. (1) For black plumes (133 sets at a smoke generator), 100 percent of the sets were read with a positive error1 of less than 7.5 percent opacity; 99 percent were read with a positive error of less than 5 percent opacity. (2) For white plumes (170 sets at a smoke generator, 168 sets at a coal-fired power plant, 298 sets at a sulfuric acid plant), 99 percent of the sets were read with a positive error of less than 7.5 percent opacity; 95 percent were read with a positive error of less than 5 percent opacity. The positive observational error associated with an average of twenty-five readings is therefore established. The accuracy of the method must be taken into account when determining possible violations of applicable opacity standards. For a set, positive error-average opacity determined by observer’ s 25 observations-average opacity determined from transmissometer’s 25 recordings. Principle. The opacity of emissions from stationary sources is determined visually by a qualified observer. 1.1 Applicability. This method is applicable for the determination of the opacity of emissions from stationary sources pursuant to §60.11(b) and for qualifying observers for visually determining opacity of emissions. 2.1 Position. The qualified observer shall stand at a distance sufficient to provide a clear view of the emissions with the sun oriented in the 140° sector to his back. Consistent with maintaining the above requirement, the observer shall, as much as possible, make his observations from a position such that his line of vision is approximately perpendicular to the plume direction, and when observing opacity of emissions from rectangular outlets (e.g., roof monitors, open baghouses, noncircular stacks), approximately perpendicular to the longer axis of the outlet. The observer’s line of sight should not include more than one plume at a time when multiple stacks are involved, and in any case the observer should make his observations with his line of sight perpendicular to the longer axis of such a set of multiple stacks (e.g., stub stacks on baghouses). 2.2 Field Records. 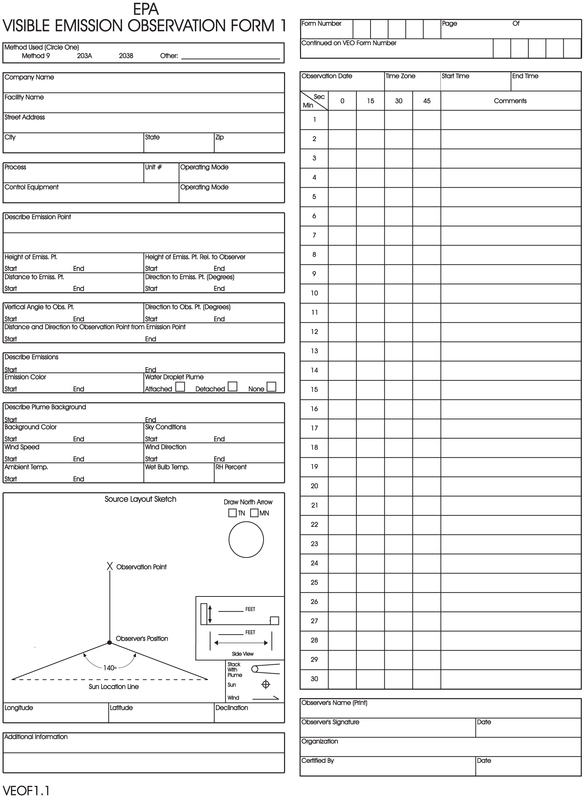 The observer shall record the name of the plant, emission location, type facility, observer’s name and affiliation, a sketch of the observer’s position relative to the source, and the date on a field data sheet (Figure 9–1). The time, estimated distance to the emission location, approximate wind direction, estimated wind speed, description of the sky condition (presence and color of clouds), and plume background are recorded on a field data sheet at the time opacity readings are initiated and completed. 2.3 Observations. Opacity observations shall be made at the point of greatest opacity in that portion of the plume where condensed water vapor is not present. The observer shall not look continuously at the plume, but instead shall observe the plume momentarily at 15-second intervals. 2.3.1 Attached Steam Plumes. When condensed water vapor is present within the plume as it emerges from the emission outlet, opacity observations shall be made beyond the point in the plume at which condensed water vapor is no longer visible. The observer shall record the approximate distance from the emission outlet to the point in the plume at which the observations are made. 2.3.2 Detached Steam Plume. 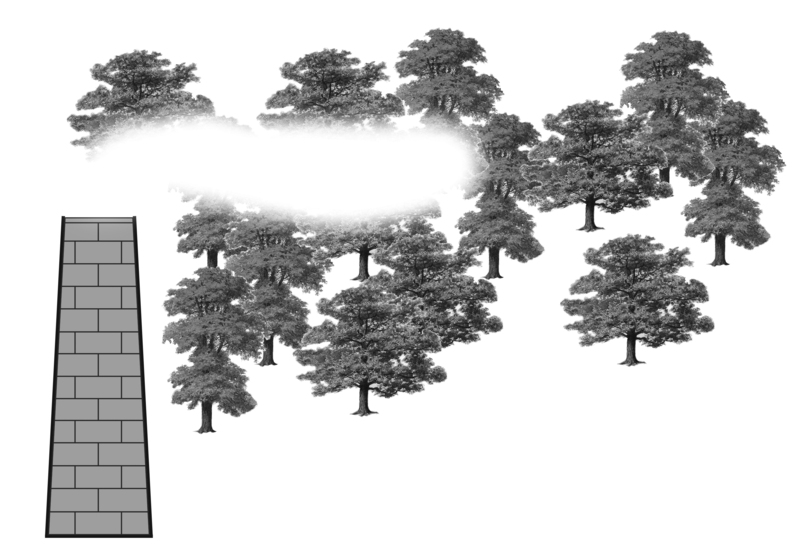 When water vapor in the plume condenses and becomes visible at a distinct distance from the emission outlet, the opacity of emissions should be evaluated at the emission outlet prior to the condensation of water vapor and the formation of the steam plume. 2.4 Recording Observations. 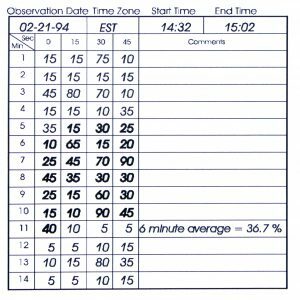 Opacity observations shall be recorded to the nearest 5 percent at 15-second intervals on an observational record sheet. (See Figure 9–2 for an example.) A minimum of 24 observations shall be recorded. Each momentary observation recorded shall be deemed to represent the average opacity of emissions for a 15-second period. 3.1 Certification Requirements. To receive certification as a qualified observer, a candidate must be tested and demonstrate the ability to assign opacity readings in 5 percent increments to 25 different black plumes and 25 different white plumes, with an error not to exceed 15 percent opacity on any one reading and an average error not to exceed 7.5 percent opacity in each category. Candidates shall be tested according to the procedures described in section 3.2. Smoke generators used pursuant to section 3.2 shall be equipped with a smoke meter which meets the requirements of section 3.3. The certification shall be valid for a period of 6 months, at which time the qualification procedure must be repeated by any observer in order to retain certification. 3.2 Certification Procedure. The certification test consists of showing the candidate a complete run of 50 plumes—25 black plumes and 25 white plumes—generated by a smoke generator. Plumes within each set of 25 black and 25 white runs shall be presented in random order. The candidate assigns an opacity value to each plume and records his observation on a suitable form. At the completion of each run of 50 readings, the score of the candidate is determined. If a candidate fails to qualify, the complete run of 50 readings must be repeated in any retest. The smoke test may be administered as part of a smoke school or training program, and may be preceded by training or familiarization runs of the smoke generator during which candidates are shown black and white plumes of known opacity. 3.3 Smoke Generator Specifications. Any smoke generator used for the purposes of section 3.2 shall be equipped with a smoke meter installed to measure opacity across the diameter of the smoke generator stack. The smoke meter output shall display instack opacity based upon a pathlength equal to the stack exit diameter, on a full 0 to 100 percent chart recorder scale. 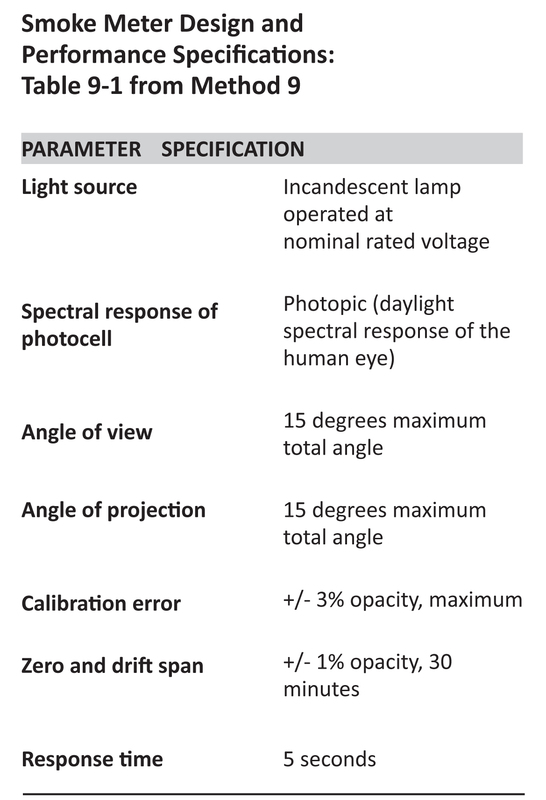 The smoke meter optical design and performance shall meet the specifications shown in Table 9–1. The smoke meter shall be calibrated as prescribed in section 3.3.1 prior to the conduct of each smoke reading test. At the completion of each test, the zero and span drift shall be checked and if the drift exceeds ±1 percent opacity, the condition shall be corrected prior to conducting any subsequent test runs. The smoke meter shall be demonstrated, at the time of installation, to meet the specifications listed in Table 9–1. This demonstration shall be repeated following any subsequent repair or replacement of the photocell or associated electronic circuitry including the chart recorder or output meter, or every 6 months, whichever occurs first. 3.3.1 Calibration. The smoke meter is calibrated after allowing a minimum of 30 minutes warmup by alternately producing simulated opacity of 0 percent and 100 percent. When stable response at 0 percent or 100 percent is noted, the smoke meter is adjusted to produce an output of 0 percent or 100 percent, as appropriate. This calibration shall be repeated until stable 0 percent and 100 percent readings are produced without adjustment. Simulated 0 percent and 100 percent opacity values may be produced by alternately switching the power to the light source on and off while the smoke generator is not producing smoke. 3.3.2.1 Light Source. Verify from manufacturer’s data and from voltage measurements made at the lamp, as installed, that the lamp is operated within ±5 percent of the nominal rated voltage. 3.3.2.2 Spectral Response of Photocell. Verify from manufacturer’s data that the photocell has a photopic response; i.e., the spectral sensitivity of the cell shall closely approximate the standard spectral-luminosity curve for photopic vision which is referenced in (b) of Table 9–1. 3.3.2.3 Angle of View. Check construction geometry to ensure that the total angle of view of the smoke plume, as seen by the photocell, does not exceed 15°. The total angle of view may be calculated from: Θ = 2 tan−1d/2L, where Θ = total angle of view; d = the sum of the photocell diameter+ the diameter of the limiting aperture; and L = the distance from the photocell to the limiting aperture. The limiting aperture is the point in the path between the photocell and the smoke plume where the angle of view is most restricted. In smoke generator smoke meters this is normally an orifice plate. 3.3.2.4 Angle of Projection. 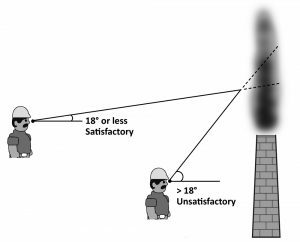 Check construction geometry to ensure that the total angle of projection of the lamp on the smoke plume does not exceed 15°. The total angle of projection may be calculated from: Θ = 2 tan−1d/2L, where Θ = total angle of projection; d=the sum of the length of the lamp filament + the diameter of the limiting aperture; and L = the distance from the lamp to the limiting aperture. 3.3.2.5 Calibration Error. Using neutral-density filters of known opacity, check the error between the actual response and the theoretical linear response of the smoke meter. This check is accomplished by first calibrating the smoke meter according to 3.3.1 and then inserting a series of three neutral-density filters of nominal opacity of 20, 50, and 75 percent in the smoke meter pathlength. Filters calibrated within ±2 percent shall be used. Care should be taken when inserting the filters to prevent stray light from affecting the meter. Make a total of five nonconsecutive readings for each filter. The maximum error on any one reading shall be 3 percent opacity. 3.3.2.6 Zero and Span Drift. Determine the zero and span drift by calibrating and operating the smoke generator in a normal manner over a 1-hour period. The drift is measured by checking the zero and span at the end of this period. 3.3.2.7 Response Time. Determine the response time by producing the series of five simulated 0 percent and 100 percent opacity values and observing the time required to reach stable response. Opacity values of 0 percent and 100 percent may be simulated by alternately switching the power to the light source off and on while the smoke generator is not operating. 1. Air Pollution Control District Rules and Regulations, Los Angeles County Air Pollution Control District, Regulation IV, Prohibitions, Rule 50. 2. Weisburd, Melvin I., Field Operations and Enforcement Manual for Air, U.S. Environmental Protection Agency, Research Triangle Park, NC. APTD–1100, August 1972, pp. 4.1–4.36. 3. Condon, E.U., and Odishaw, H., Handbook of Physics, McGraw-Hill Co., New York, NY, 1958, Table 3.1, p. 6–52. © Eastern Technical Associates, Inc.